Disclosure: I received a sample toy to review. No other compensation was received and all views expressed are my own. 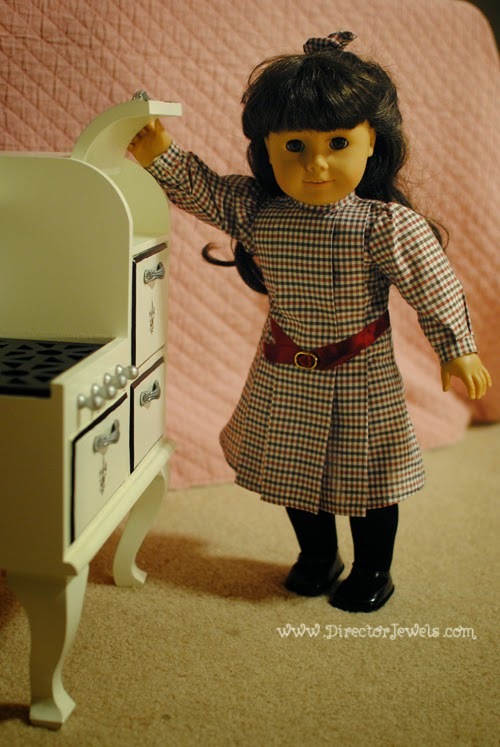 When I was nine years old, I received one of the most treasured gifts of my childhood: a doll named Molly. She was quickly promoted to the highly coveted position of favorite toy and spent the next several years being lovingly dragged with me everywhere. I dressed like her, I pretended my best friends had the same names as her best friends (seriously), and naturally, I poured over the magazines depicting her collection of accessories and outfits and made long wishlists of all of the things I thought she needed to have. 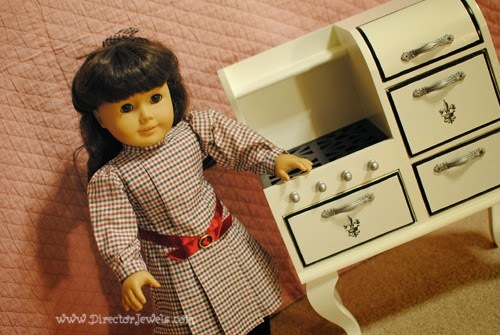 While I did receive a lot of items for my doll collection (maybe even too many - but I honestly did play with them), I never really had any large furniture items to enhance her world. I made up plenty of things for her to play with and all was well - but that doesn't mean I was not excited out of my mind when this particular review item arrived at my door this month! Yes, even twenty years after my beloved doll entered my world, I can't wait until my daughter is old enough for me to pass down my doll collection to her. And while I don't want her thinking that she needs every accessory on the market, I will definitely be turning to The Queen's Treasures for some beautifully designed, historically accurate outfits and furniture pieces. Founded by "Queen" Joann Cartiglia, this small business based in historic Stroudsburg, PA has grown quickly with the national demand for 18" doll clothing, accessories, furniture and the "wow" factor. The company's Bake Shoppe won the Top Toy for 2013 for Creative Play from Creative Child Magazine. I find the selection of historical playthings so refreshing! When I was a kid, I devoured every piece of historical fiction I could find, and loved pretending to be from an earlier, simpler time. There are plenty of 18" dolls that offer modern attire and accessories, but I find the historically accurate collections to be so much more vivid and endearing. I hope that my daughter feels the same way! 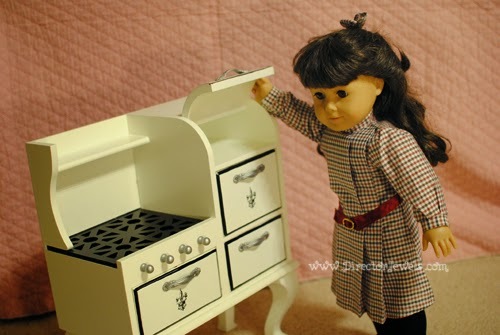 We received the Vintage Style Stove for review. 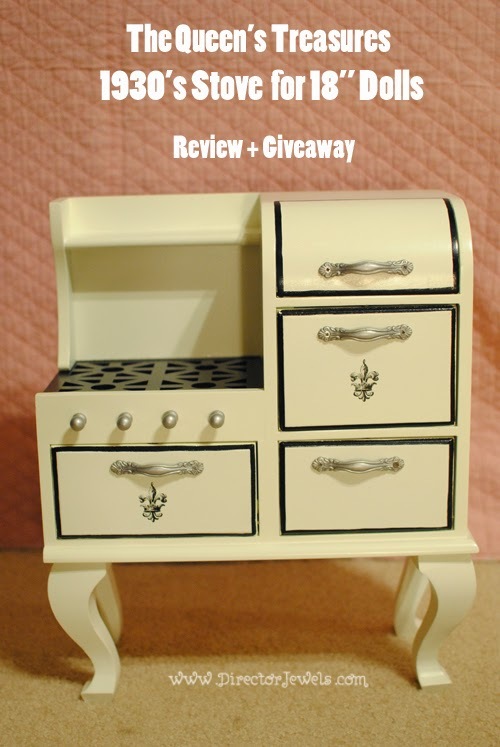 It is sized for 18" dolls and features wooden construction that is painted in cream to represent the enameled look of years gone by. There are four stove top "burners" (they don't actually heat - no worries), a main oven with removable baking rack, a broiler, and compartments for utensils and warming. 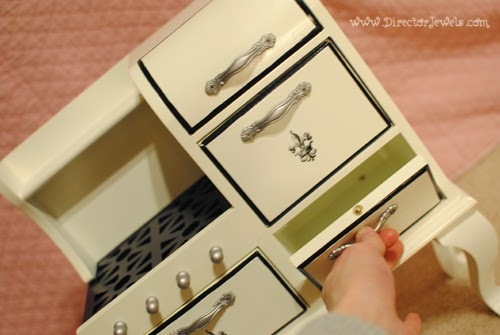 With four compartments altogether, there is a lot of space for pretend baking to take place. The Stove is 9 3/8" tall. The Stove is part of the 2015 design series, which features life during WWI. Outfits and accessories from the brave Salvation Army Doughnut Girls, vintage stoves and an antique sewing machine are samples of the available designs for this year. The attention to detail on this piece is excellent. 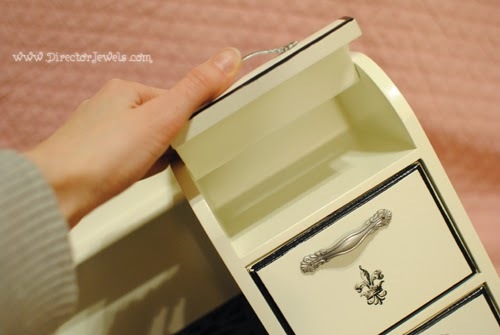 I love that each cabinet opens and closes with just a gentle tug. 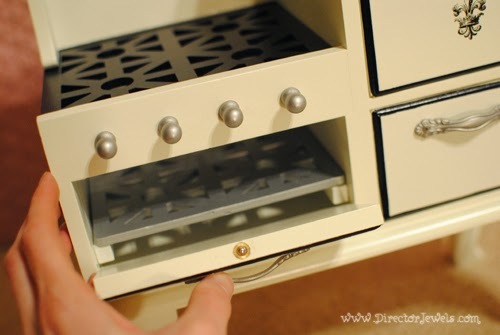 All but the compartment on the top right are equipped with a magnetic latch to keep the door in place. 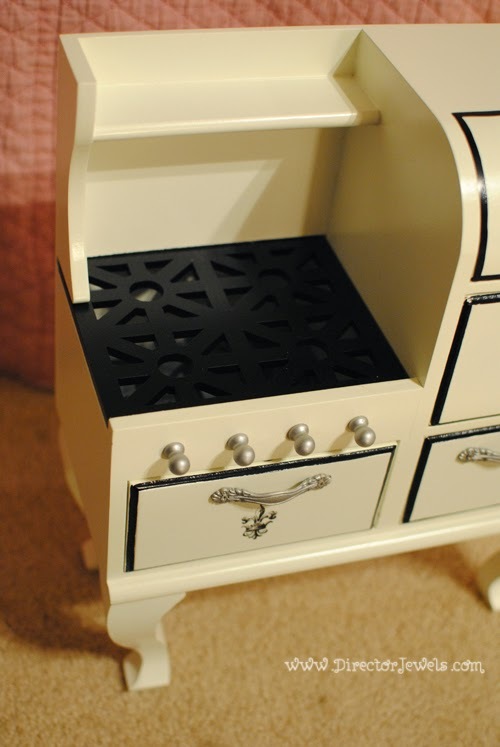 The attention to detail is lovely and I can tell that this is a quality piece that should stand up to many hours of little girls playing with it! It is sturdy and heavy enough that it will not fall over with just a bump. Does your daughter have an 18" doll? Would she love this accessory? Make sure you follow The Queen's Treasures on Facebook, Twitter, and Pinterest for all of the latest updates and new product releases! 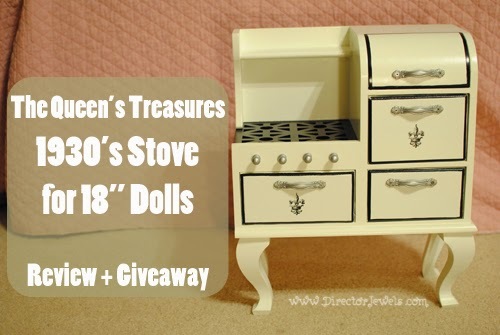 One Director Jewels reader will win a Vintage Stove from The Queen's Treasures! This giveaway will end on March 11 at 11:59pm CST. This giveaway is open to US readers only. Winner will be emailed and will have 48 hours to respond or prize will be forfeited. Disclosure: I received a sample toy to review. All opinions expressed are my own. For more information, you can read my Giveaway Policy and my Disclosure Policy. I love the 1930s sewing machine. I love the bunny romper for 18" dolls! 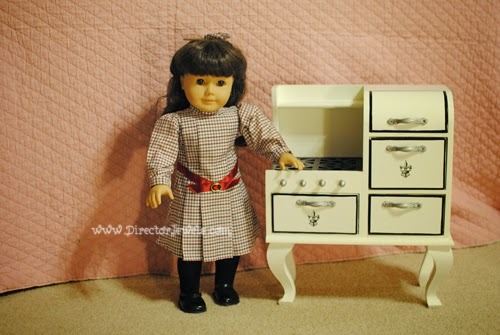 I know my little girl would love to have a "whole" kitchen for her dolls, so I'd also love the Farmhouse table and chair set. I would love to have the 1930's American Style Sewing Machine, Accessories & Stool Fits 18" Girl Doll. It is so awesome! I love the tea party pieces, especially the English Rose Porcelain 2 Tier Tidbit Tray! My daughter loves the desk and school accessories! I love Cinderella's Shoe shoppe! I absolutely adore the Royal-Tea Room Snack Shoppe Set! I like the 1800's Style Sunday Dress! So pretty! The Farmhouse Collection Farm Table & Chairs catches my eye!